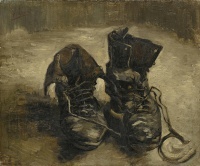 A pair of shoes by Vincent van Gogh, Paris, 1886. Martin Heidegger mentions this particular work in The Origin of the Work of Art as an example of a painting that reveals (aletheia) a whole world. 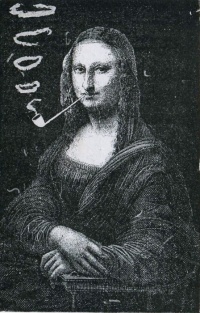 This article is concerned with the terms and concept as used in and applied to the visual arts, although other fields such as aural-music and written word-literature have similar issues and philosophies. The terms objet d′art or art object are is reserved to describe works of art that are not paintings, prints, drawings or large or medium-sized sculptures, or architecture (e.g. household goods, figurines, etc., some purely aesthetic, some also practical). The term oeuvre is used to describe the complete body of work completed by an artist throughout a career. Unless indicated otherwise, the text in this article is either based on Wikipedia article "Work of art" or another language Wikipedia page thereof used under the terms of the GNU Free Documentation License; or on original research by Jahsonic and friends. See Art and Popular Culture's copyright notice. This page was last modified 20:14, 17 April 2018.